Welcome. 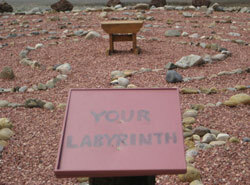 This page is designed to inspire you to build a labyrinth yourself. Tip #1: Quite frankly, If I can do it...you can do it! You're visiting the official Doing a 360 site created by Rev. Dr. Nancy Ash. Enjoy photos taken in 2010 while creating our classical, 7-Circuit Labyrinth in a fairly small backyard. The ancient Labyrinth (back by popular demand) is a wonderful, sacred yet simple tool for walking meditation, contemplation and prayer. Here you can see the layout in stone over grey weed-prevention paper. Using that material is Tip #2: This was a two-person (hubby Jon and I) project that took only a few weekends to complete. The circumference stones (360) are from Taos, New Mexico, and are therefore very special; all carefully, hand-picked from the river. Tip #3: Start calmly and simply. Perhaps this is really tip #2.. Consider building a smaller labyrinth for your first project. Ours is 17 ft. a 7-Circuit, Classical Labyrinth. It's the smaller size used for portable, fabric labyrinth workshop set-ups. One of many labyrinth designs, this style is the oldest known (so far) on the planet, originating in Crete about five thousand years ago. In order to build a labyrinth you need to have a deep desire to establish a sacred portal to a vortex point in the Earth. In other words...you don't really create these meditative spaces...they just sort of "build" you - so to speak. Earth calls...and you respond; you just know, in your-heart-of-hearts that the land wants it there. We are therefore sometimes referred to as "The Keepers" of The Circles. Labyrinth Designs Still unfinished at this stage, my photo illustrates a little path of crushed stone that I designed to take us from our patio to this sacred space. It is important to have a clear path in and out. Remember, a maze (in which you can get lost) is not a labyrinth. Labyrinths represent life: "Doing a 360" ...there is a clear way in and a path out! So Tip #4 is definitely plan ahead! Reap the benefits - build a labyrinth today! "Doing a 360" Jonathan walks his labyrinth most mornings, weather permitting. What a great stress-buster as well for after work. Here he is enjoying the fruits of his loving labor as "A Keeper" of The Circles. Okay… perhaps YOU are inspired to build a labyrinth now? We hope so; they're wonderful to have available right in your yard. I invite you to look at some other beautiful labyrinth designs available. A hobby of mine is walking labyrinths wherever I go, which is a powerful 360 meditation method. Click link to continue… I've some lovely photos of labyrinth designs in the amazing Northern New Mexico mountain town of Taos.